2014 marks the 50th anniversary of several pivotal events in the 20th century civil rights struggle, including the Civil Rights Act of 1964, the U.S. Supreme Court’s decision in the Griffin v. Prince Edward County school desegregation case, Mississippi Freedom Summer, and the New York World’s Fair. On this Martin Luther King Jr. Day, we look back on a civil rights battleground that was also important in the career of Martin Luther King Jr.: St. Augustine, Florida. In 1964, St. Augustine, Florida, was poised to celebrate the 400th anniversary of its founding. With the anniversary celebrations looming, in May 1963, St. Augustine’s NAACP branch wrote a letter to President John F. Kennedy asking him to withhold $350,000 in federal funds from the city’s anniversary celebration because of widespread segregation in the city. One month after appealing to President Kennedy, the St. Augustine NAACP branch began to lead demonstrations and sit-ins against segregation in St. Augustine. From July through September 1963, civil rights protesters staged demonstrations that were often met by violence. During a rally on Labor Day 1963, for example, NAACP leaders and their supporters were beaten by St. Augustine police. St. Augustine was relatively quiet during the winter of 1963-1964, but demonstrations resumed in the spring of 1964. On March 31, 1964, civil rights demonstrators marched on the Ponce de Leon Motor Lodge. Police arrested many of the demonstrators, included Mrs. Malcolm Peabody, the mother of the governor of Massachusetts. On May 18, 1964, Martin Luther King Jr. made his first visit to St. Augustine. Eight days later, on May 26, about 300 black marchers held a demonstration at the historic slave market in St. Augustine. The next day, another group, “mostly of high school boys and girls,” marched toward the downtown area of St. Augustine. 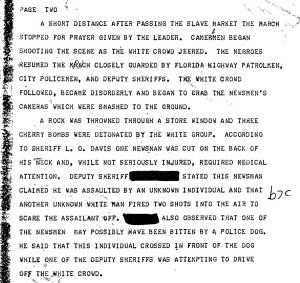 While they were en route, St. Augustine police warned the marchers that a group of whites was occupying the historic slave market site. The marchers walked past the market but did not stop, and then returned home. The next day, civil rights forces took the same route. This time, a group of 250 hostile whites confronted civil rights marchers. The whites attacked the newsmen who were covering the demonstrations. That night, someone fired rifle shots through the cottage where Martin Luther King was staying. The demonstrations continued and tensions continued to escalate between blacks and whites in St. Augustine in June 1964. On June 11, Martin Luther King Jr. and nine of his colleagues were arrested and jailed for refusing to leave the segregated Monson Motor Lodge. The next two weeks witnessed additional demonstrations and more arrests. Finally, on June 30, 1964, businessmen in St. Augustine agreed to abide by the Civil Rights Act of 1964. 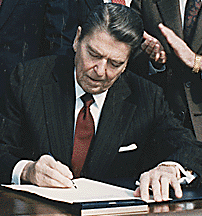 In July, with the Civil Rights Act of 1964 signed into law by President Lyndon Johnson, white businessmen began to desegregate their establishments in conformity with the new law. This timeline of events and the document images above are extracted from ProQuest History Vault. 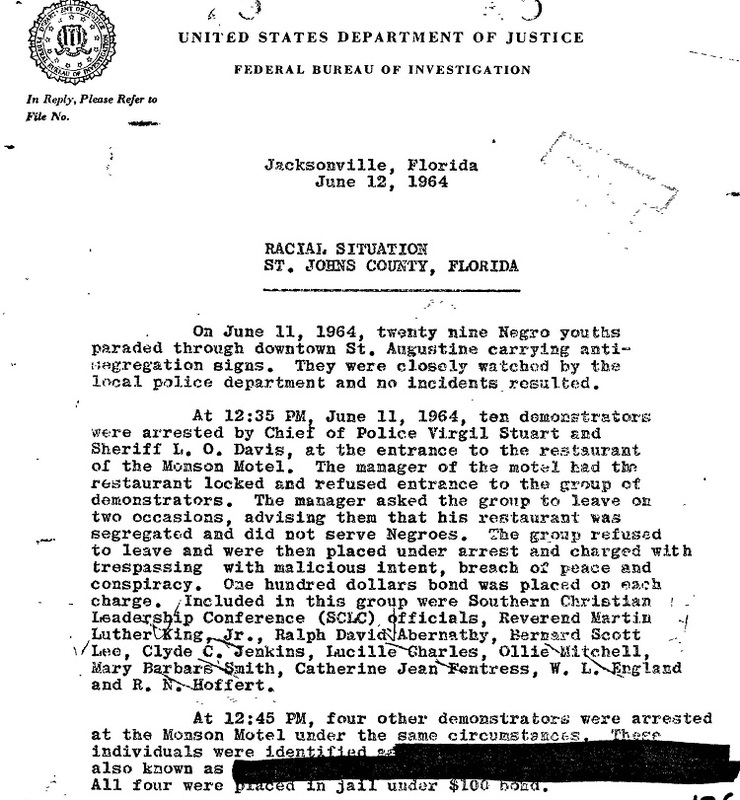 Documentation on events in St. Augustine in ProQuest History Vault comes from multiple collections, but the most notable is a collection of FBI files on “Centers of the Southern Struggle.” FBI agents assigned to St. Augustine reported on events there with an investigative independence and energy that was unusual, providing FBI headquarters in Washington (and now researchers!) with virtually day-by-day accounts of the events in St. Augustine. These files are supplemented by documents on St. Augustine in History Vault Collections: NAACP Papers, the Claude A. Barnett Papers, and in the Civil Rights during the Kennedy Administration. 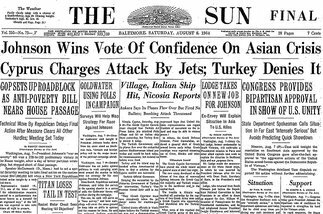 In addition to History Vault, newspaper coverage of events in St. Augustine in 1963-1964 is available in ProQuest Historical Newspapers(TM) - Black Newspapers. Librarians: Sign up for a free trial, and see our Black History Timeline.